Welcome to FltPlan,a free flight planning service for creating and filing IFR and VFR flight plans, obtaining weather briefings and navigation logs for flights in the U.S., Bahamas, Canada, Intra-Canada, Mexico, Central America and most Caribbean airports. FltPlan offers pre-flight, in-flight, and post-flight tools including: Airport/FBO Information, Approach Plates / Digital Charts, Routes with Radar Overlay, Nearby Airports, Fuel Stops, Quick Info, Area Fuel Prices, Flight Schedule Calendar, Customizable A/C Performance, Stored Routes, TOLD Card, Flight Tracking, Planned ATC Routes, Email Notifications, and Historical Flight Tracking with Weather Overlay. Fleet Tracker – up to 10 aircraft. Email/text notifications – 20 individual address lines. Planned ATC routes and take offs and landings sent to your smartphone. Integrated with your flight plans. Flight history – current and previous month. Flight Tracking is real time information from the Air Traffic Control (ATC) system. Actual departure time or proposed departure time if aircraft has not departed. Actual Arrival time or estimated arrival time if the aircraft has not landed. 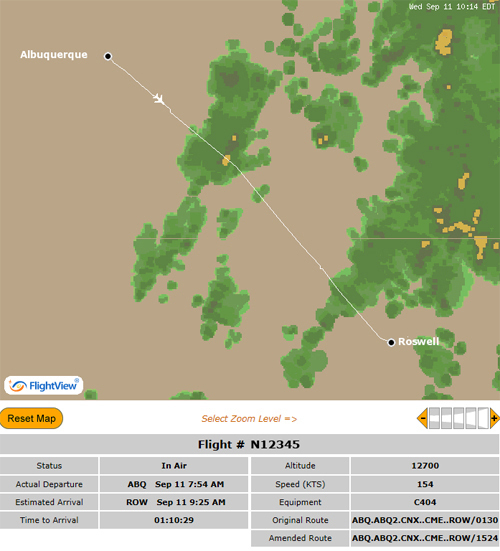 The flight tracking display shows a graphical representation indicating the aircraft's current position, the planned route of flight, and a weather radar overlay. There is no additional charge for tracking your blocked tail number with any of our premium flight tracking services. Flight tracking orders are processed by telephone only. Call 1-203-262-8900 to get started. We require a credit card (Mastercard, Visa, American Express) and your FltPlan user name. There is a one month minumum charge for new orders. Payments may be made monthly or annually. Do not send credit card information via email. Flight Tracking and all other premium services are non-refundable. Aircraft owner/operator name and address. Email address the FAA can use to communicate with the aircraft owner/operator regarding the blocking request. Call Sign or Tail Number to be blocked. Blocking level desired: ASDI Vendor Level. ASDI Vendor Level • Block at this level if you need to track your aircraft. The FAA coordinates with all ASDI vendors to have your aircraft registration number blocked from their respective programs. Blocking the aircraft registration at the ASDI Vendor Level removes the aircraft registration from the aircraft flight data. FAA Level • Block at this level if you do not need to track your aircraft. For a higher level of security, operators may choose to block their aircraft flight data at the FAA Level which will remove all aircraft flight data before it is transmitted to the ASDI vendors. This means the information never reaches any ASDI vendor and is not incorporated into their system. Blocking at this level will prevent you from tracking your blocked tail number.